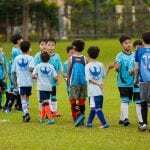 Grades 4-5 students who were part of the Youth Sports Soccer Season at UNIS Hanoi had been training hard for 5-6 weeks before the final event – the Soccer Festival on 13 November. Our coaches, Mr Imran, Mr Gibbons, Mr Phi, Mr Geoff and Mrs Mindy were amazing. They helped us not only to train hard during the season but also to have fun and learn to work with others. At the end of the season we had a tournament where we come together with other schools in Hanoi to have a fun afternoon of soccer. All the weeks of training led to a great festival. The girls teams won a few, tied a few and lost a few and the boys teams were the same. Overall the Youth Sports Soccer Season was such a great time filled with joy and hard working. Thank you to the great coaches that helped us from day one.